And personal stories to encourage you to keep gathering at your table. All recipes are gluten and dairy free. That moment everyone is hungry and you realize you never made a plan for dinner. That's not a fun feeling, right friend? It doesn't have to be that way. You CAN say goodbye to that hurried meal time scramble at 5 o'clock! + learn how to eat healthy in a sustainable way. Confidence instead of feelings of failure in the kitchen? Yes please. The best way to change our habits is to renew our minds with words of truth on a particular topic. That's what these podcasts and sermons have done for me when it comes to pursuing hospitality. Grab a clickable PDF of the top 8 hospitality related podcasts that have transformed my life! Planning is key to a successful Whole30. I'm here to make it doable, even for the busiest woman out there. 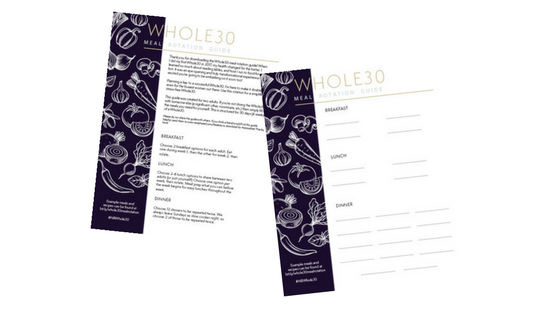 Use these planning sheets for a simplified, stress-free Whole30. Plan breakfast, lunch, dinner, snacks and condiments so you're all set for your next Whole30 + recipe and meal ideas included! holiday + event planning sheet to use for everything from your work Christmas party to Thanksgiving dinner, to your child's birthday party! One of the best ways to meal plan is to be inspired by the seasons! Eating seasonally saves money, tastes better and allows you to never get bored with your meals! Each season I look at this list and make a master meal plan for the 3 months of that season, then when a new season approaches, I revisit the list to make another master list for the next, and so on! Eating seasonally cuts my meal planning time from over an hour to under 20 minutes. Receive an instant download of our checklist to make swapping to safer personal care and beauty products easy.